The background is a slip-slap of acrylic paint mixes of Ivory (White with a little bit of Burnt Umber). Then I added some of that Ivory to a mix of Burnt Sienna and Quinacridone Red to match the large red floral tones and used a slip-slap striation on the background which was done with a specialty brush - Royal Langnickel's Aqualon Wisp Flat Brush. The border at bottom and left is stenciled with the same ivory/red/sienna mixture. As well, the lace was stenciled with a paper doily and that same mixture. The florals, bottom left, were fussy-cut from scrapbook paper and decoupaged in place. The large butterfly was from a vintage digital image resource. printed and just the body attached in place with wings lifted for texture. The upper left flower and butterfly is a diecut embellishment. I tinted the flower with marker to coordinate. The band of butterflies on right is a diecut embellishment as well, which has the butterflies lifted in 3-D and glitter ... just a special little bit of fun. The tag was done in my graphics design program and then decoratively corner punched on 3 corners. 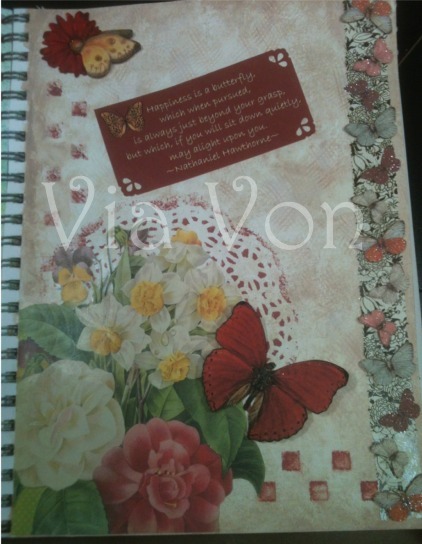 Love the butterfly border.. Great quote you have used, a lovely page..
Another soft and beautiful page! !